* Remembering that you are going to die is the best way I know to avoid the trap of thinking you have something to lose. You are already naked. There is no reason not to follow your heart. * For the past 33 years, I have looked in the mirror every morning and asked myself: ‘If today was the last day of my life, would I want to do what I am about to do today?’ And whenever the answer has been ‘No’ for too many days in a row, I know I need to change something. * No one wants to die. Even people who want to go to heaven don’t want to die to get there. And yet death is the destination we all share. No one has ever escaped it. And that is as it should be because Death is very likely the single best invention of Life. It is Life’s change agent. It clears out the old to make way for the new. Right now the new is you, but someday not too long from now, you will gradually become the old and be cleared away. Sorry to be so dramatic, but it is quite true. * If you haven’t found it yet, keep looking. Don’t settle. As with all matters of the heart, you’ll know when you find it. And, like any great relationship, it just gets better and better as the years roll on. * Your work is going to fill a large part of your life, and the only way to be truly satisfied is to do what you believe is great work. And the only way to do great work is to love what you do. If you haven’t found it yet, keep looking. Don’t settle. As with all matters of the heart, you’ll know when you find it. * Sometimes life is going to hit you in the head with a brick. Don’t lose faith. * My favorite things in life don’t cost any money. It’s really clear that the most precious resource we all have is time. * Let’s go invent tomorrow instead of worrying about what happened yesterday. * I think if you do something and it turns out pretty good, then you should go do something else wonderful, not dwell on it for too long. Just figure out what’s next. * You can’t connect the dots looking forward, you can only connect them looking backward. So you have to trust that the dots will somehow connect in your future. You have to trust in something – your gut, destiny, life, karma, whatever. This approach has never let me down, and it has made all the difference in my life. * Everybody’s life is limited, have the courage to follow your dreams. * That’s been one of my mantras — focus and simplicity. Simple can be harder than complex. You have to work hard to get your thinking clean to make it simple. But it’s worth it in the end because once you get there, you can move mountains. * I’m convinced that about half of what separates the successful entrepreneurs from the non-successful ones is pure perseverance. * Innovation distinguishes between a leader and a follower. * Here’s to the crazy ones — the misfits, the rebels, the troublemakers, the round pegs in the square holes. The ones who see things differently — they’re not fond of rules. You can quote them, disagree with them, glorify or vilify them, but the only thing you can’t do is ignore them because they change things. They push the human race forward, and while some may see them as the crazy ones, we see genius, because the ones who are crazy enough to think that they can change the world, are the ones who do. * Stay hungry. Stay foolish. 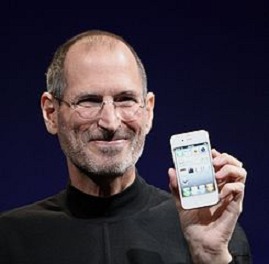 I hope these quotations of Steve Jobs influenced your mood positively. If not, don’t miss watching his fabulous speech from the year 2005 in The Stanford University. Don’t forget to share this page with friends, if you like it!